Q. Where is hot in May? A. May is a perfect time to visit the Mediterranean. It’s cheap, warm enough for sunbathing but not too hot for sightseeing. This year – 2019 – the deals are even better than normal because of the uncertainty over Brexit. Or consider the Caribbean where the weather is great, but prices are now at low season levels. The holiday season in the Mediterranean typically runs from April until late October. Tour operators make most of their profits in July and August, when prices are highest, and they usually struggle to fill beds at the beginning and the end of the season. But these are the times when the Med is arguably at its best. Hotels roll out early-season booking deals in April and early May, but this year because of fears over Brexit, many deals are being extended throughout May and even into June. Every week I select the best deals and send them free to your inbox. 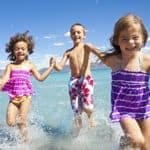 >> If you’re travelling with children, see family holidays in May half term. If you’re travelling alone, see solo holidays in May. The most southerly Greek island, Crete promises guaranteed sunshine in May with long days of unbroken sunshine, low humidity and pleasantly cool evenings. The only caveat is that sea temperatures won’t be high. It’s fine for kids, but adults may find the water a bit nippy. Check out these lovely boutique hotels in Crete. See the latest offers on accommodation from i-escape. 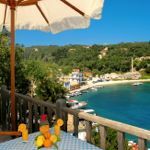 Also consider: the smaller Greek islands of Skiathos and Paxos (accessible only by boat) which offer an even more laid-back experience. On the other hand, if you want a stylish modern hotel, you’ll find great deals on the island of Kos. For a high-quality all-inclusive, head to the IKOS Dassia in Corfu. The Turquoise Coast of Turkey will be hot in May and uncrowded. Prices are low at the moment, so this is a great place to grab an early season bargain. Head to the charming resort of Kalkan (or nearby Kas). Simpson Travel has a great collection of hotels and villas along this picturesque coastline. See its latest offers. Also consider: if you like water sports, head to Mark Warner’s new Paleros Beach Resort, where all activities – including water skiing – are in the price. It also has deals in May. The Italian island of Sardinia will be lovely in May and you’ll have the pristine sands and clear water seas almost to yourself because the Italians don’t tend to visit until August. You’ll find some fabulous hotels including Forte Village and lots of historic towns and villages to explore. It’s a similar picture in Sicily where we recommend the beachfront Verdura Resort. See the latest offers in both. 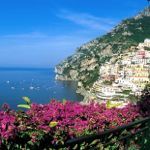 Also consider: the south of Italy, including the peerless beauty of the Amalfi Coast and the often-neglected region of Puglia which has great beaches. See more holidays in Italy. It will be getting warm in the Balaeric Islands. I recommend Mallorca at this time of year, as it’s particularly beautiful slightly out of season. Away from the package resorts, you’ll enjoy rolling countryside swathed in wild flowers, quiet coves and outstanding restaurants. Rent a luxury villa or opt for a short break in Palma. See Oliver’s Travels for villa deals. 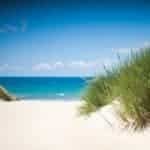 Also consider: Spain’s Costa de la Luz which has miles of unspoilt beaches lined with dunes and pine forests. The nearest city is Seville which makes a great base for exploring Andalucia. Or get to know the lesser-known region of Extremadura on a self-drive tour from Seville to Madrid, staying in historic Paradors. See the latest offers from Sunvil. The Algarve is rightly known for excellent hotels, friendly resorts and a long season that stretches from spring through to autumn. An alternative to staying in a resort is to rent a car at Faro airport and explore the back roads and dramatic countryside away from the crowds. You can stay in some of Portugal’s network of pousadas, which are historic buildings converted into good-value hotels. This fly-drive holiday starts at just £445 including flights. 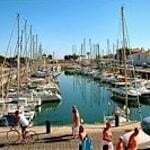 Also consider: the Alentejo which is an unspoilt region that looks like the Algarve 40 years. Inside tip: this is where the Portuguese go on holiday. The French island of Corsica is unspoilt by tourism with sublime beaches, great food and rugged mountain countryside to explore, whether by car or on foot (best not to try this in August unless you want to risk sunstroke). You’ll usually find some great special offers at this stage of the season. You can also take a short break. Also consider: flying for another hour and you’re in the exotic city of Marrakech enjoying temperatures of 27°C and low humidity. After you’ve done the sights and the souks, cool off in the Atlantic beach resort of Essaouira with its surf beaches. See the latest deals from Fleewinter. Heading east, Bali is a great option in May with warm sunshine but not the heavy rainfall seen in some winter months. There is plenty to keep you busy for a week or two with surf beaches, Hindu temples, yoga retreats, rice terraces, volcanoes and great food. Once you get there, it’s remarkably good value. Spend at least some of your time at a secluded retreat in the cultural centre, Ubud. See these offers on luxurious long-haul travel. Also consider: Thailand where you can kayak at sunset, enjoy a close encounter with elephants and join a tasty street food tour in Bangkok. Get away from the crowds at the wonderful Koyao Island Resort. May is a great month to visit the Caribbean – before the hurricane season poses a threat, but after the peak winter season. 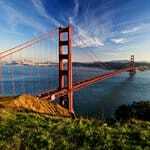 You can often get great deals on flights and packages. Temperatures are consistent across the region with Barbados offering an excellent range of hotels with sunset views. You could go all-inclusive in Jamaica, upmarket in Antigua or diving in the Cayman Islands. If you crave silky white sandy beaches, head to tiny Anguilla. Find out more about Caribbean weather in May. Also consider: the quirky pristine island of Bermuda can be chilly and damp in the depths of winter but May is perfect, with long sunny days, blue skies and pink beaches. Stay at Cambridge Beaches and – if you’re on a budget – Grotto Bay Resort. The Indian Ocean is a great option for beach lovers. 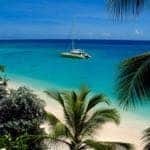 The Seychelles, Mozambique and Mauritius are all at their best in May with more than eight hours of daily sunshine and temperatures around 29°C. A calm sea means excellent visibility, so it’s a great time of year for diving, snorkelling or simply gazing at the water from the safety of a beach lounger. 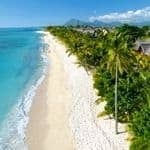 Flying to Mauritius from the UK is easy: a direct overnight flight with no jet lag. It’s also popular for weddings abroad. See the latest special offers. Also consider: it’s monsoon on the south-west coast of Sri Lanka – the main tourist beach destination – but it’s a perfect time to visit the lesser-known and more spectacular beaches of the east coast. 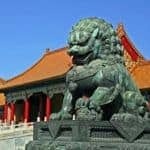 May is a sensible time to make the trip to China: Beijing reaches 27°C but without the humidity and rainfall of June-August, making it perfect for exploring the Great Wall and the Forbidden City without working up too much of a sweat. See the latest offers from Cox & Kings. Also consider: Brazil for paradise beaches, natural wonders and some of the world’s most exciting cities – including Rio de Janeiro where the temperature will be around 26°C. It’s a wonderful time of year to visit America including the Pacific Coast Highway in California and the great National Parks of the West. You could arrive in style on a transatlantic cruise or explore the backroads of the States in a motorhome. San Francisco is particularly sunny in May. For deals, we recommend American Sky. Also consider: New York which sparkles in springtime before the oppressive heat of summer. 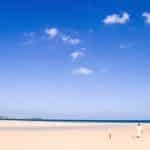 >> You can also find the best half-term holidays, more ideas for where to go in May plus expert tips on where to honeymoon in May.